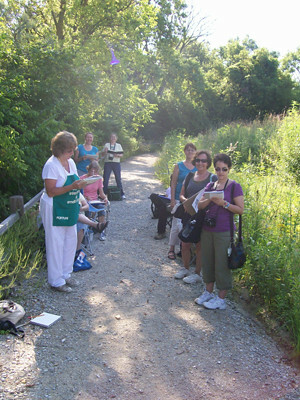 August 2011 Sketch Class Results – Let's Paint Nature! The group, 10 including myself, was the biggest we’ve ever had and on a morning like this one, it couldn’t have gotten any better; The sky: pure blue, the temps: perfectly mild, and the artistic fellowship while connecting with nature: magnificent! 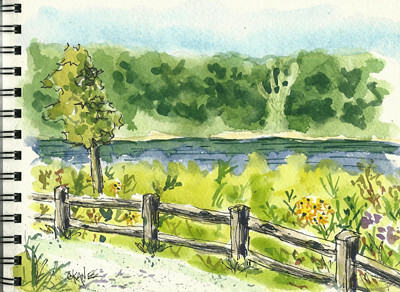 We decided to hang out by Long John Slough and sketched the trail and background. It always amazes me how beautiful everyone’s artwork turns out and how uniquely different they all are. I couldn’t say a negative thing about any one of them! Here is a close up of my sketch. I try to emphasize quick and loose watercolor work, it helps to free yourself from being too rigid and it’s a lot of fun! 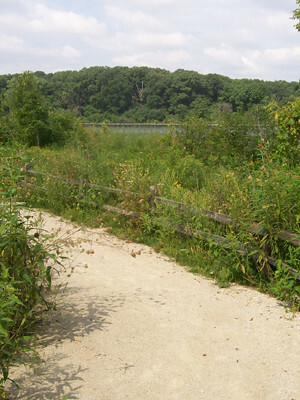 After our class we had enough time, so some of us decided to hike the White Oak Trail. On our hike we discovered this unusual looking mushroom. Someone commented that it looked like brains…ewww…yes it does! I’m not sure which type of mushroom this is and cannot make a positive match in my field guide book. I have to admit, when I see a large group of students before starting class, I tend to get nervous. The “what if’s” start racing through my head…what if I can’t find a good spot to paint…what if they don’t like my sketch…what if I say something wrong? But after a few minutes in nature all of the worry melts away, like only nature can do, and we have a wonderful time as usual. This month was no exception, we had a splendid time playing in nature! Could this be similar to what you found? 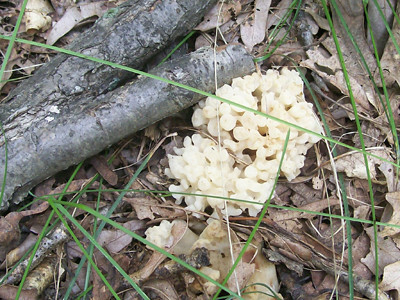 White Brain Fungus? I wish I was closer too to join your walks. I tried looking up your mushroom on the internet and didn’t find anything that resembled it. There is a “Brain Mushroom” but it isn’t white and it looks like a large slightly soggy raisin. I think your mushroom looks more like Coral but I couldn’t find anything that fits that description on the internet either. Very interesting! It looks like one of the white coral fungi. 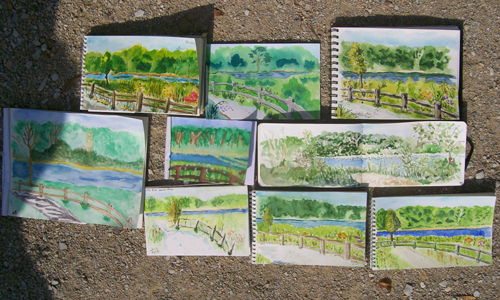 I love the sketchbooks–you are a good teacher! Daryl: Thank you for the information! I will have to look into that. Thanks for helping. Jean: Thanks! I wish you could join our group as well. Isn’t nature w o n d e r f u l. Thanks for trying to seach my mushroom! Joan: Thank you!!!! I will have to look them all up!